Nokia's Android Phone - A First Look! Nokia is one of the world"s most prestigious and most reputed companies when it comes to mobile handsets. They have years of technical expertise and knowledge that have helped them conquer great heights. The manufacturer is well known for its reliability and service backup. Nokia has in the recent past been flooding the mobile scenario with surprises. First it was the turn of the N9 which was Nokia"s first Meego Venture. It was a Superphone from Nokia that ran using the Linux based Meego OS. Nokia launched the mobile with Meego OS even though the Meego OS was fast losing its appeal. Another stumble happened when the news about the first Windows Mobile powered phone from Nokia leaked into the internet. The company however did not comment on any questions raised about the phone. Before the entire buzz surrounding the Windows based phone has settled down a bit, another shock was propagated in the Internet regarding Nokia Android Phone. The leaked pictures of the Nokia phone indicate that the Nokia Android phone runs on either Froyo or Gingerbread versions of the Android OS. The Nokia phone is yet to be named or announced so there is no news regarding its specs and features. 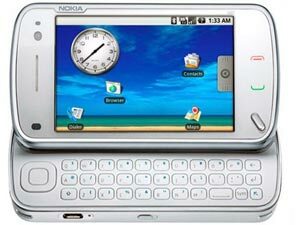 However there is some mention of its name being Nokia NB72. Nokia Android Phone in its first impression from the leaked pictures looks more like an i-Pod styled handset designed on the cues of the N9. However, the credibility of this picture is an issue as there have been previous fake rumours and pictures of the phone storming the internet. However, the possibility of the phone being a test version cannot be ruled out. This could very well be a prototype model. However, Nokia is currently focusing on its Windows based phones so we cannot expect the Android based phone to hit stores any time in the near future. But Nokia as mentioned earlier, is full of surprises. So nothing can be taken for granted. Apparently the pictures of the Nokia Android phone might somehow be linked to earlier revelations by guys at Nokia that they are working on a Android powered phone and this prototype might well be the first venture of Android OS over a Nokia hardware. The leaked pictures were found on the same website that first published pictures of Nokia"s Windows based mobile handset. It was also met with the same amount of suspicion but proved to be right all the way when Nokia itself launched the mobile at the Nokia Communications Event 2011. So if the internet leakage history is anything to beckon with, then we can be sure of a mouth watering Nokia Android phone too in the coming years.